My father in law is coming to stay for three weeks so I have been deep cleaning the entire house to get it ready for his arrival. Cleaning has never been so easy using Better Life™ products. This fantastic line of green cleaning products is not only safe and naturally derived but it also cleans very effectively. I remember the days of cleaning using harsh chemicals, bleach and ammonia and I am so grateful that those are gone forever thanks to the availability of a better alternative. 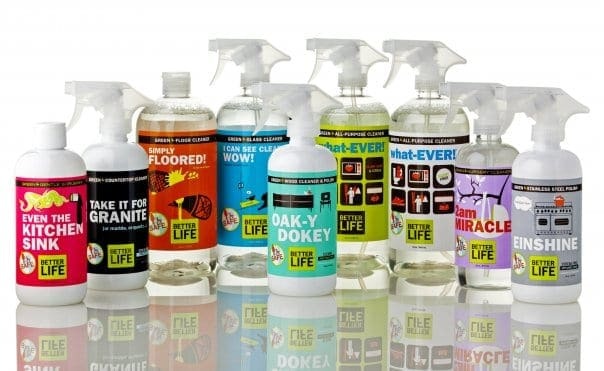 Better Life™ cleaning products is exceptional in that it does not contain alcohol, dyes, ethoxylates, petrochemical solvents, sulfates, synthetic fragrances or VOC’s. Instead it cleans by using coconut and vegetable based surfactants and essentials oils…….and it cleans really well! I have three children and a boxer so it makes it a challenge to keep our house clean. Due to my daughter’s severe asthma and allergies it is critical that we have a clean home without dust, dirt and grime which can all aggravate her condition. More importantly, the key to maintaining a safe and clean house for my family requires natural cleaners because harsh chemicals in other cleaning products can cause my daughter to have an asthma attack or irritate her skin and respiratory airways. I used all of the products in the Better Life™ Starter Kit and was very impressed. Not only did it not cause any irritation but my daughter was able to use the products and clean alongside me without any issues at all with her asthma/allergies. It is hard to pick a favorite because I like all the products in this line but the what-EVER Green All Purpose Cleaner was fantastic. I use this for cleaning everything from kitchen counter tops, cabinets, refrigerator doors and even the microwave. It is scent free and utilizes Clary-sage and citrus to make this one extraordinary cleaner! Another favorite was the Simply Floored! ™ floor cleaner for hardwood, tile, marble, bamboo, vinyl, laminate and other sealed floors. I used in my 0-Cedar Mop (stay tuned for that review!) and really liked this product. My husband is very particular about the floors and even he was impressed with how sparkling our tile was after mopping with Simply Floored! ™ There was absolutely no residue or stickiness after cleaning and it didn’t require rinsing making cleaning my floors a breeze. I hate cleaning our stove because it is always such a time consuming and messy task but using the Einshine Green Stainless Steel Cleaner made the task so much easier and I haven’t seen my range top shine so brightly since it was brand new. Oak-y Dokey™ is a wonderful furniture product that will “clean, polish and protect” wood surfaces. I have slotted wood closet doors that are almost impossible to clean and the dust is terrible for my daughter. I simply sprayed the Oak-y Dokey™ directly on the wood surface and then used a cleaning rag to clean each slat. It was still a time consuming project but in the end all of the dust was gone and I noticed over the last week that it even seems to repel dust from accumulating as quickly too! The 2am Miracle™ is an excellent product to clean baby areas and I used it in my children’s bedroom and playroom too. Finally, I Can See Clearly, WOW™ glass cleaner is fantastic for those nose prints from our boxer and fingerprints from my little ones all over every window and glass door in our home. Just a few squirts and a wipe down left all of my glass surfaces clean, for a few minutes at least until my troop messed it back up again. Better Life™ cleaners do not have an overpowering scent but there is such a lovely hint of the essential oils that I really love. None of the cleaners compete with one another and can be used together to make your house sparkling clean. Overall, I was very impressed with this line of products and almost panicked when I noticed that several of the products were almost used up. Fortunately, Better Life™ cleaners can be purchased online on their website or at Drugstore.com or at major retailers such as Whole Foods, Ace Hardware, Walgreens and Fresh Market. You can visit the Better Life™ website to find a store location near you by using the handy store locator feature. I would highly recommend purchasing the Better Life™ Starter Kit which will give you a fantastic set to try many of the products from this review and is also an excellent value at only $35.55 (free shipping too!). I wiould like to try OAK-Y DOKEY – Green Wood Polish 16 oz. 2am Miracle would be wonderful to try! Subscribes to the Better Life newsletter. Likes Better Life on Facebook. The thing I’m most interested in is the Simply Floored because I have a lot of hardwood floors and would love to clean them with a green cleaner. Thanks. Voted for you at Picket Fence Blogs. Thanks. Thanks for the giveaway…we would like to try out Better Life Even the Kitchen Sink, Green Gentle Scrubber 16 fl oz ! …just voted for Simply Stacie @ Picket Fence Blogs. I would like to try the what-EVER all-purpose cleaner.